We’ve got the Internet. We’ve got the web sites. We’ve got the instantaneous communication. It’s all here, and ready to use. If you’re using the Internet for your business, you’re using all of the aforementioned in full force. In your travels, you’ve likely been involved in some stage of your web site design, either directly with the construction of it using a web design program, or indirectly in giving your web site design ideas to a web site designer to create for you. In either case, you’re in a fun and creative position, as you get to build something that reflects your establishment, much like your own house or consumer product. This is elating; just bringing the web site to life is an experience worthy of making a great sale, or completing a tough business task. But then, the inevitable happens: your web site crashes. You’ve worked hard to put it together, and go to publish it online or try to make an update, and it fails. You get the error warning on your computer screen, and feel your heart sink. The elation ends, and the frustration sets in. The wrong button has been pushed somewhere, and your web site has gone into a tech coma, as has your potential online client traffic. Things seem lost, and you are lost as to what to do. Mary Shelley’s Frankenstein is a good book to keep on your shelf, next to your web site design manuals and aids. It’s inspiring to show how life can be brought back using technology. With your web site collapsing, it’s just a matter of using your eye and your computer to give it a bit of a rebirth. To start, you should check all of your Meta data to see if, in fact, a wrong button, especially the space bar, was pressed when creating the tags of your web site content. 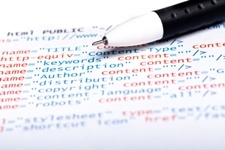 Whether you use HTML or XML, Meta data tends to be sensitive stuff, and if you create tags—i.e. <h1>—they have to be punched in with the correct symbols, letters, and spaces. If there’s an oddity in there, the pages won’t publish. If you’ve done it yourself, you may have to go over all of your content to check to see if your tags are correct. If you’ve gotten someone else for content copywriting services, have them double-check their work. It’s an honest enough mistake, but the wrong letter or space placed in your content can have devastating effects on the publication success of your web material. One thing that can really throw you is graphic material. No doubt, you’ve spent a lot of time and money doing logo design and development. Getting this stuff to fit into your Meta data is tougher than paragraph content, so make sure your logos, photos, and other graphics are tagged appropriately. The same goes for when you do digital poster and exhibit design. This stuff looks beautiful online, but can be tough to get published online. Yet, you simply have to make sure it is tagged correctly so that it appears as you want online, and doesn’t cause the rest of your web material to crash. Graphics are a different beast altogether, so don’t be afraid to get help with them for your web site design. When doing web site design, you have to remember that it is reflective of your own corporate identity development. It has to both look good and be in working order all the time. Getting in the habit of making sure your web site is always going strong, and knowing how to troubleshoot problems down to the basic design level, will keep your web site a force to be reckoned with and a sign to your clients, both new and existing, that you are serious about your business online.